A box of instant mashed potatoes. That’s the one thing every food stylist always walks around with, says Charlotte Omnès. If you have a giant bowl and only four shrimp to fill it with, you pad the bowl with mashed potatoes underneath to make it appear full. Food can be a temperamental beast; lettuce wilts, ice cream melts. But it’s Omnès’ job to make that part invisible to you — and instead to leave your mouth watering. Previous jobs: I’ve done everything from catering on cruise boats and restaurants to working at a recipe development company. Developing recipes, where I saw things through all the way to the marketing stage, led me into food styling. What do you carry with you at all times? You’re not gonna carry around pots and pans. 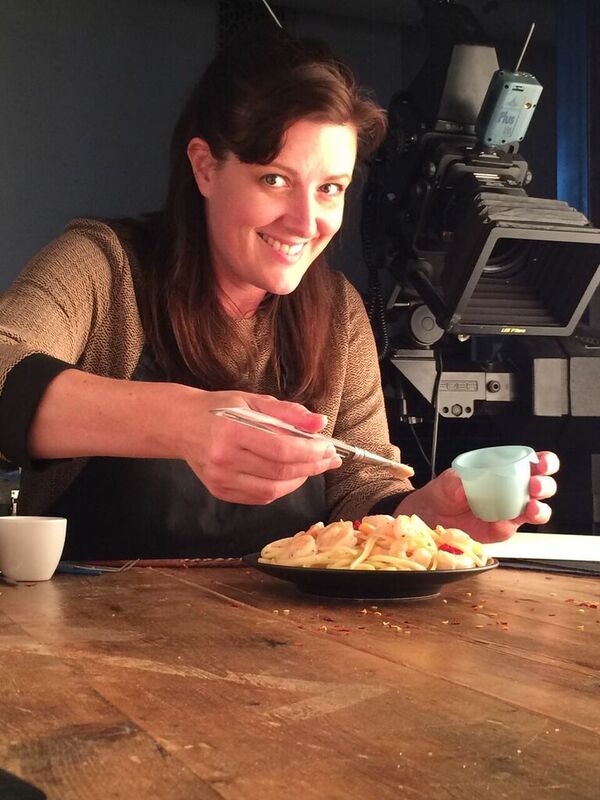 I have a kit that I bring with me to the studio that’s filled with special food styling tools: tweezers, paint brushes, paper towels, a butane torch, a steamer. Those fit in a suitcase. But I also have a giant storage unit where I keep things like a reach-in freezer for ice cream styling. When you get to a studio for a shoot, what’s the first thing you do? I might get started by putting out a stand-in, which is similar to what the final product will look like — like throwing greens on a plate to represent a salad so the photographer can set up the lighting. We make the final perfect burger or salad — the “hero” — when we’re actually ready to shoot. Those are about 10-hour days. But then I also run my own business, which involves doing the books, planning and preparing — scouring the city and trying to find pots and pans and ingredients. What percentage of the food you work with is fake? There’s no fake food in food styling. We’re selling a product; you can’t use food substitutes or another company’s brand. The only time we get into food replacements is if we’re selling maraschino cherries, for example, we might use fake ice cream (by mixing powdered sugar and icing to form the right texture) to cooperate in order to get the cherries perfect. The cherries are what we’re focusing on. That must mean you get to eat the goods afterward. When the product is sitting on set for a long time, like a hamburger under the lights for an hour, nobody wants to eat that, so we’ll throw it out. But we do get to eat a vast majority of the food. I’m usually begging people to bring food home at the end of a shoot since we’ll have, like, 10 pounds of broccoli or something. Your best tricks for manipulating food: Beverages almost always look deliciously refreshing and cold, but that’s mostly not real. We use fake ice, and the frost on the glass is usually a little water sprayed on to make it look like it’s condensing. Otherwise, if you’re shooting soda, it’s really hard to control what’s going on in a glass; the ice might melt too fast, changing the color of the liquid. Mayo can get a gross translucency when it sits under super-hot lights, so I’ll use alfredo sauce instead. You can use non-dairy creamer instead of whipped cream, which creates a shell that won’t wilt under hot lights. How long does food prep take? It can take hours. Something photographers may not consider is the space that’s needed to prepare. They’ll allow very little space for a stylist to move food around, so we’re all twisted and contorted and crawling around. I have a good pair of sneakers. The hardest food to handle: Ice cream. I’ve done some pretty intense ice cream shoots. I’ll style it inside my reach-in freezer, but the key is not to shock it by going from cold to hot too quickly. I’m constantly trying to keep it in a happy zone of about 20 degrees while I mold it. It’s like working with clay. What would people be surprised to learn about your job? It’s not just pushing food around on a plate; you need a great eye for composition and an understanding of food on a molecular level so you can control it. Arranging food on a plate for someone to eat is totally different than getting food to look great for the camera’s eye. Best part of your job: Being creative every day and problem solving on the fly. Recently, someone had a problem getting a good shot of a tea bag slowly steeping in hot water. I had experience with something similar, so we tried that technique — increasing the density of the water by adding corn syrup so the tea wouldn’t flow in too quickly — and it worked. Most challenging part of your job: Dealing with all sorts of different people who have different needs. Someone new on a set might take more coaxing to be open to your ideas. How much room do you have to get crazy and creative? Shooting food for editorial, like a magazine, is a lot looser and messy than ads. Advertisers want their stuff to be so perfect and controlled that there’s very little room for anything that might happen naturally. But there’s a growing trend now in making advertising look more editorial, less manipulated, prettier. That makes stylists excited, but it will take much more than stylists to change things. The weirdest thing you’ve ever made using food: When I was 16, I had an apprenticeship at a restaurant in the Northwest, where I grew up. I had to fillet salmon, and was always sad when I had to throw away the skin; it was so beautiful. Many years later, I convinced a photographer to work with me on a project: We made a corset out of salmon skin. People might see that type of thing on my website and then hire me to style cheese. How has your job changed over the past decade? Digital makes things so much easier. We used to take an image on a Polaroid, loading the film and sending it to the lab in hopes it would turn out well the next day. Stylists used to have to manipulate food a lot more in those days, because it would be an hour before you could even get the film in the camera and take a photo. Now, you click a button and blow it up, and the client is right there to sign off. When you’re out to brunch, do you spend a lot of time arranging the perfect shot for Instagram? I’m terrible at Instagram, actually. I’m around cameras my entire life, so I am the last person to whip out my phone and take a crummy iPhone picture of my food. I’m usually taking a photo to remember an inspiring dish rather than to post it. Don’t go into this line of work if you’re a spender. Being self-employed isn’t the best avenue if you’re not good at running your own books. Instead, you could work as a photographer on a magazine staff — or at companies like Unilever and Kraft, which employ full-time food stylists and recipe testers. A culinary background is crucial. Everyone gets into this business by assisting someone else and learning their tricks, then assisting other people and learning their tricks, and then putting it all together and figuring out how you want to do things. Think outside the box. A lot of my work is getting people to stop and say, “Wait, how did they do that?” It’s bordering on model-making. You can find more of Omnès’ work on her website. All photos above were styled by her. This entry was posted in Art and Design and tagged food by Megan Hess. Bookmark the permalink.